The great thing about the warmer weather is the freedom of being outdoors. For me, and for most people I guess, the world comes to life when the temperature rises and the evenings lengthen. There are so many more activities to enjoy. But you know what I find really enjoyable and relaxing? Sitting around a fire pit table in the evenings just talking with a small number of friends and sharing a drink. Seriously. Sure, it’s nice to call up some friends and relax on the patio over a drink but gathering around a table with a fire in the center brings a whole different dimension. There’s a comforting, cozy feeling of intimacy that draws people together as they share a balmy evening sunset and the fire becomes the focal point. Ah fire gazing; it’s one of our most basic instincts I think. One of the nicest looking fire pit tables I have seen is the Strathwood St Thomas model. It’s an elegant, open-scroll pattern outdoor table that stands midway between the height of a coffee table and a dining table and is quite comfortable for either use. 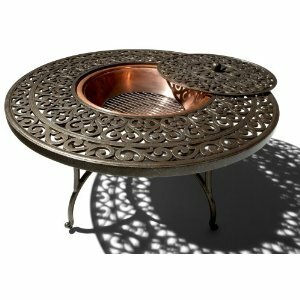 But its secret is revealed when the center lid is lifted to expose its added dimension; a copper fire pit. While the fire pit’s in use and the flames are mesmerizing guests there’s plenty of table area around for resting food and drinks. On hot days the same fire pit can become an ‘ice pit’ and used as a drinks cooler. Or maybe as storage for outdoor paraphernalia like suntan lotions and mosquito repellant. Fabricated from cast aluminum the 42 inch diameter table is powder-coated in a dark brown color with bronze highlights and silver flecking. Very handsome. That aluminum construction makes it totally weatherproof and gives a robust, solid feel and yet it is easy to move about. Oh yes, one more thing – when you take delivery you’re going to need to do a bit of assembly work. Like bolting the legs on! That’s it! If you can manage that then you won’t regret your purchase. The Strathwood St Thomas Fire Pit Table will bring a touch of classic elegance to any patio. 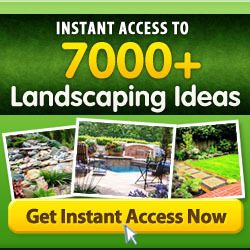 It’ll bring a touch of envy from your friends and neighbors too. And if you’re smitten by the style there is a matching range of outdoor furniture.